When it comes to world opinion, the Obamas commanded no respect. You can’t blame Michelle, as she didn’t set the pace for things by bowing to world leaders. Nor did she go on an apology tour on behalf of America as the supposed leader of the free world. Things are very different with Donald Trump. Crass he may be at times, Trump leaves no doubt that he takes himself seriously. The man exudes success. And though at times Trump seems like the “billionaire next door,” the man knows how to be regal. Even kingly. And every king needs his queen. Boy did America get hers. Despite the Left’s attempt to deride America’s first queen with cheap shots on her modeling, Melania radiates class. The double-standard by the Left when it comes to Melania would be sickening, if we took the Leftist lapdogs seriously. Melania has created a jealousy within the Left that no feminist can fix. The class and elegance of Melania Trump is unmatched in the history of First Ladies, with Jackie Kennedy a close second. And then there is the beauty of the First Lady, unmatched by any in history…period. As the First Couple traveled to Saudi Arabia, their style would be tested. A patriarchal country where women serve men’s every whim and fantasy. A country where men don’t mingle with women publicly or even shake a woman’s hand. According to the Quran and Hadiths, Muslim men strictly forbidden to shake hands with non-Muslim women. The first time Obama visited Saudi Arabia, Michelle was nowhere to be found. In his final visit, Obama tried to recover from his disastrous first meeting, and had Michelle in tow. She wore American clothes. However, in Indonesia, there she was, in headdress. 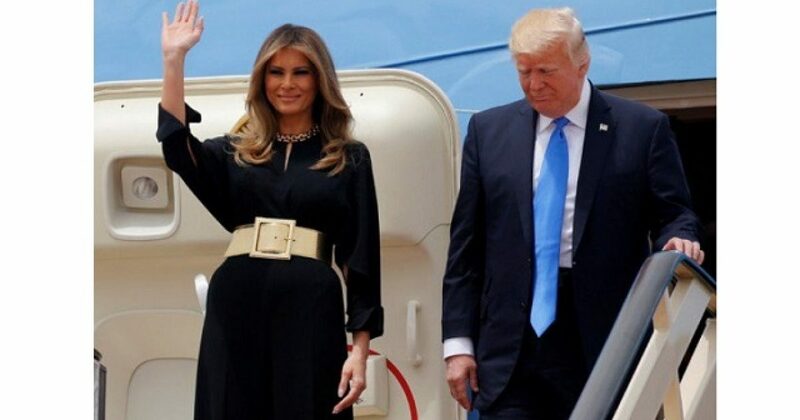 However, as President Trump and First Lady Melania descended Air Force One in Saudi Arabia’s capital city of Riyadh on Saturday morning, Melania acted as if she was surveying part of her kingdom. Regardless of the laws of the land in Saudi Arabia, Melania didn’t cover her head as many female foreign leaders had in the past. But he shook her hand. The Saudi King shook Michelle Obama’s hand years ago as well. As we know, there are doubts about the religion of the Obamas. But there is no doubt about Melania’s religion in that she does NOT practice Islam. The world clearly sees that America’s new leadership will represent American values. Though we respect all cultures as America proves daily, we will export the spirit that has made America the best country in the world. Looks like NOW could use a chapter in Saudi Arabia!